Well, today I have just conduced my second interview for a TEFL Teacher Recruitment company in China. I was nervous at first and worried that my second interview would be similar to my first. The first interview went okay; I had to be in the upper part of my house to get a better reception and I was only able to see part of my interviewers face. I am wondering if this is common practice when interviewing for jobs in China. Both interviews took place in their Beijing offices; which were a little noisy at the start. There is a large time difference between here in the UK and in Beijing. Beijing is seven hours ahead of me and I had to conduct both my interviews in the morning. The first interview took place at 9am GMT; which made it 4pm CST (China Standard Time). It was also the end of the day for them. I must remember this whenever I call home when I start teaching in Asia. The second interview was supposed to start at 7am/2pm but on the confirmation email I was sent 8am/3pm – which I preferred. However; this was not passed on to the person who called me (on Skype) at around 7am. I think that there was a confusion of the Time Zone converting. 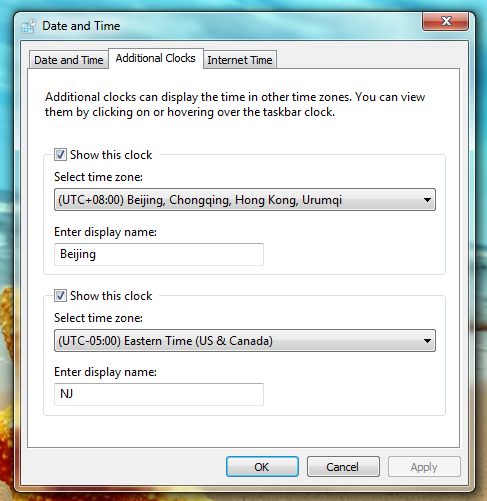 I use the clock on my laptop; I have set it up to have Beijing as one of the Time Zones. I will change this depending on where I move to. I was sent some material to use for my second interview; two eBooks and some information on what I was to do. I found tis rather difficult as I thought that on the information I would be given an age group or level to work with. The books I felt were aimed at Elementary level and for young children. I had to create at least one activity to do and it should last for about 20 minutes. I could only use three pages from the book – I would have preferred to use the whole book as that would have made the reading exercise easier. I decided that I was going to pretend that the second interviewer was one of my current four year old students. When it was time for the interview; she asked me ‘how old I wanted her to be?’ – Elementary and around 4 to 5 years old. I chose the book “Visiting Grandma and Grandpa”. I found this interview very hard; as the interviewer took her role seriously. Only one word answers and not much facial expressions. Working with younger children you want to be able to get them to hold and see the book better or even reading it with them. Only using three pages was hard. I ended up using four – I had turned them into flash cards to help with the “having the book experience” . Fingers crossed it worked! At this very moment in time; I have not received any information or details about if I was successful or not. After my first interview, the person who had organised the interview with me contacted me and told me that I had passed and would be moving onto the second interview. It has almost been an hour since I finished my interview and I have had nothing. I have this feeling I will not hear anything until tomorrow now. As the office in Beijing must be closed for the day. I’ll keep you all posted with this.